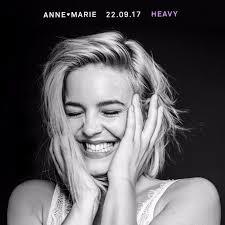 Anne-Marie is mostly famous for her ambitious collaborations with various artists: Rudimental, Nick Jonas , Shakehips and especially Clean Bandit (smash hit “Rockabye”). Now the British singer gives us another taste of her upcoming debut album. The track, untitled “Heavy”, is a sweet tune co-written with Ian James (Little Mix, Olly Murs, Craig David). It tells a story of a struggling relationship. “Heavy” serves as the follow-up to “Ciao adios”, which reached number 9 in the UK chart. Anne-Marie’s album is expected to be released later this year.